Still mulling over the perfect holiday gift for your special someone? Instead of gifting clothes or electronics, treat your significant other to something they’ll really love: diamond jewelry. Diamond jewelry is the gift that keeps on giving and will be sure to show your loved one just how much you care. Whether your S.O could use an iced out watch, gold chain or diamond earrings, refer to our holiday gift guide for some great holiday gift giving ideas. Men love watches, and they can never have enough of them. Diamond watches are a classic timepiece that’s at the forefront of the real hip hop jewelry industry. A stunning diamond watch is a sharp, classy accessory that allows a man to showcase his personality, style and prestige. 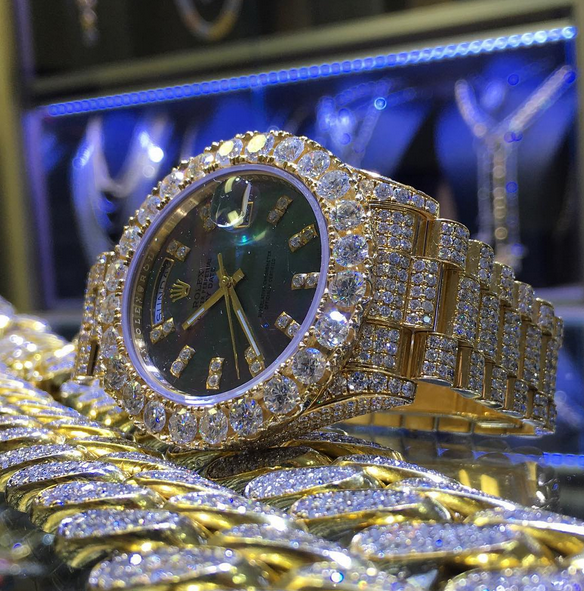 It’s no wonder that the biggest hip hop stars and celebs are rocking extravagant iced out watches. At TraxNYC we offer a huge variety of beautiful diamond watches in every price point. Whether you want a custom platinum diamond watch or a classic Rolex, we have it all. With our diamond watches, your man can enjoy the same level of bling his favorite celebs. Browse watches here. Like the iced out watch, the gold diamond chain is at the pinnacle of the hip hop jewelry scene. Gold chains can be flashy or understated and come in a wide variety of styles and sizes to suit every taste. A gold chain can be worn alone for a classic look or with a bold diamond encrusted pendant to make a statement. Whatever style your man prefers, a gold diamond chain is ideal for any occasion. Shop gold chains here. Ear piercing is one of the earliest forms of body modification, and it still exists today as a major fashion staple. Over the years, diamond stud earrings have become insanely popular, and this is due in part to hip hop stars who adopted diamond earrings as their look of choice. Today, men’s diamond earrings have evolved to include a range of styles, sizes and colors. Along with the traditional white diamond earring, black, rose and yellow diamonds have also become popular go-to looks. View diamond stud earrings here. Men aren’t the only ones who love diamonds. Diamonds are a girl’s best friend, and one of the most significant pieces of women’s diamond jewelry is the diamond ring. Wearing a gorgeous diamond ring on her finger shows that she is loved, valued and eternalized. At TraxNYC, you can find a diamond ring that is just as beautiful and radiant as she is. With our large assortment of diamond rings, you’ll be sure to find something that’s destined for her; or you can design a custom piece. Shop diamond rings here. Another great option for women is the diamond bracelet. Like other diamond pieces, the diamond bracelet represents beauty, value, sophistication and prestige. A diamond bracelet is a timeless and classic accessory that can be worn for all different occasions and nights out on the town. With a diamond bracelet from Trax, she will be mesmerized by its sparkle and radiance. We offer gold, platinum and silver bracelets with diamonds of all shapes, sizes and colors to suit any style and taste. Browse diamond bracelets here. Not only are diamond earrings a fashion staple for men, but also they are a must-have jewlery item for women. Hoop earrings are a classic piece that has never gone out of style. They are just as relevant today as they were in the past, but today’s hottest styles are those containing diamonds. Every woman should have a pair— or multiple—of glamorous diamond hoop earrings in her collection. Give her the gift she’s always wanted and view diamond hoop earrings here. To give your S.O an extraordinary holiday gift that will be cherished for an eternity, shop our diamond hip hop jewlery at TraxNYC. We have the largest assortment of hip hop jewelry on the Internet and can even create a remarkable, one-of-a-kind custom piece for you. Have a happy holiday with Trax! 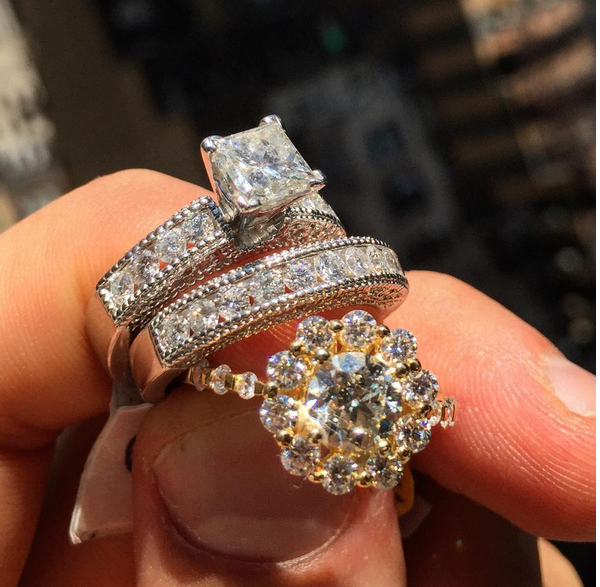 TraxNYC is a jewelry firm located in the heart of the diamond district in Manhattan, NY. In business since 2005, our company is committed to providing the widest selection of hot diamond and gold jewelry at the best wholesale values. We specialize in creating custom jewelry pieces for one-of-a-kind memories and wishes and in mens jewelry. View our hand-picked diamond jewelry collection. Every item on our website can be customized to your specifications. Thanks for visiting our blog -- enjoy your stay and be sure tell us what you think in the comments! Copyright © 2019 TraxNYC Blog. All Rights Reserved.